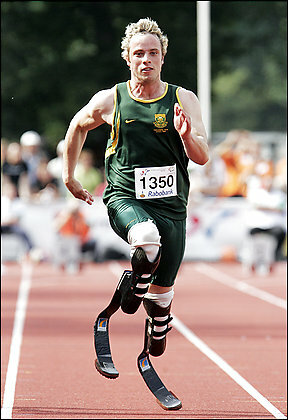 Hard to believe that Oscar Pistorius, the double-amputee sprinter, has won his appeal to trial for the upcoming Beijing Olympics. The Court of Arbitration for Sport overturned a ban imposed by the International Association of Athletics Federations, after the latter said his carbon fibre blades give him a mechanical advantage. Essentially the ruling rests on the fact that the IAAF did not prove sufficiently that Pistorius gains an advantage from the “Cheetah Flex-Foot” artificial limbs. Of course, Pistorius is allowed to compete in the Paralympics, and currently holds the world record in the 100m, 200m and 400m events. It would appear that he is looking for a chance to compete at a higher level, and many support his case as inspirational. But therein lies the problem. As one Slashdot reader put it rather eloquently, “It might be inspirational to see a dyslexic child competing in a spelling bee with the aid of a spellchecker, but it’s hardly the point of the competition.” The decision is obviously a contentious one, and as someone who has no interest in the Olympics and very seldom sees an event, I would not normally have a point of view. However it seems that this decision places the Olympics in dangerous territory for the future. It may well be the case that the appendages offer Oscar Pistorius no advantage above what his normal capabilities might have been, however as no comparison is possible, that would be exceedingly difficult to prove either way. What is certain is that the decision opens the door to others in the future, who may well be afforded advantages above and beyond their natural capabilities. Athletes are made to perform within a fluid bubble of ‘natural conditions’, separated from drugs that would enhance their performance, and divorced from technologies in sportswear and sports gear that would give them that unfair edge, yet these rules exist to keep the playing field level, whilst this latest decision clearly attempts to level a different field. Mechanical advantage or no, Pistorius will have to train hard simply to qualify, and one can’t help but feel that were he already faster than the able-bodied competition his appeal would have failed. Instead this decision allows everyone to feel the cushy ‘aww’ factor of seeing someone disadvantaged compete in the Olympics, but the real result of this ruling, after Pistorius’ name is long forgotten, will be the precedent which allows athletes with mechanical replacements into the competition. There’s a future yet for the cyborg olympics.